Saving on fuel and reducing emissions is more practical with the 2017 Toyota RAV4 Hybrid. Find out how this SUV can make everyday life enjoyable. 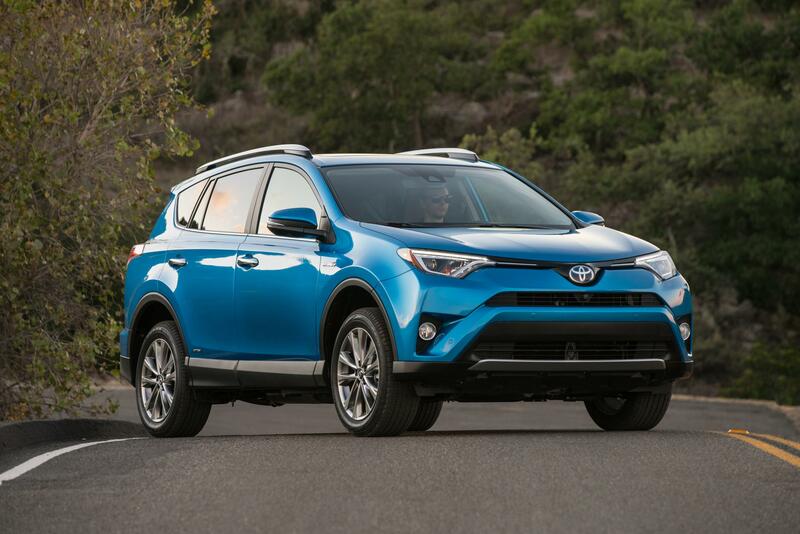 When you want to combine efficiency with everyday practical utility, the 2017 Toyota RAV4 Hybrid is the answer. This compact SUV doesn't lose any of the features from the gasoline-only version, while making it possible to go further between gas stops. Thanks to advanced onboard technologies, you can learn to drive as efficiency as possible, and receive extra help watching out for dangers on the road. Toyota offers three trim levels: XLE, SE and Limited. You get a unique set of standard features on each one, so finding the right combination is a pretty simple task. Of course, the central feature of this SUV is the advanced hybrid powertrain. It produces 194 net system horsepower, so you can make short work of getting on the freeway. A continuously variable transmission (CVT) smooths out acceleration at any speed. To help you better manage the hybrid system, the vehicle comes with a unique gauge cluster. It displays when the system is charging or sending power to its wheels, as well as detailed information about its operation. The energy monitor, which is accessible through the infotainment center, helps you as a driver manage the operation of the gas engine, electric motor and hybrid battery. It can be used to show detailed information about how the gasoline and electric power is being distributed, plus how the battery is being recharged. A Cold Area Package helps with the weathering frigid temperatures. It includes a heavy-duty battery and starter, plus a more robust heater. Just as amazing is the electronic on-demand all-wheel drive with intelligence. It makes each journey feel more secure, using an electric motor to send torque instantaneously to the rear wheels as needed. That combines with an independent MacPherson strut front suspension and double-wishbone in the rear, providing you with a sense of superb handling in any situation. The electric power steering with a power assist rack-and-pinion setup adds further to that feeling of being in control. Plenty of safety innovations are loaded into the RAV4 Hybrid. Power-assisted, antilock four-wheel disc brakes provide solid stopping capability, including in emergency situations. The Star Safety System is standard on all models, bundling together items such as electronic brake force distribution, vehicle stability control and Smart Stop Technology. Another included bundle, Toyota Safety Sense, includes a pre-collision system, pedestrian detection, lane departure warning with steering assist, automatic high beams and dynamic radar cruise control. You can add a blind spot monitoring with rear-cross traffic alert, which uses sensors to detect other vehicles outside of your field of view, warning about their presence. Hill start assist control is standard, holding the brakes when you switch to the accelerator pedal while stopped on an incline. Every trip, whether it's a quick run to the grocery store or a cross-country adventure, is more enjoyable thanks to the smart layout of the RAV4 Hybrid interior. All five seating options come with plenty of space, while clever storage options abound so you can stash essential items. Available conveniences include seat heaters, keyless entry/ignition, a HomeLink remote, navigation and a more premium sound system to name a few.